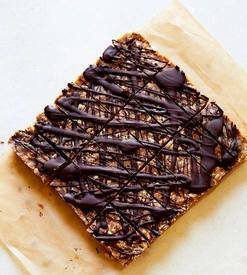 Puffed rice bars w/ tahini & dark chocolate! In the warmer months, I’m always looking for easy, throw-together meals that are more about “assembling” than actual cooking. Smoothies are great, of course, but in looking to change things up a little I found these amazing breakfast bars. I know they look like candy, but they’re actually protein-packed, whole grain and totally capable of being a breakfast food. You could always omit the chocolate part, but I believe there’s nothing wrong with just a hint of decadence at breakfast. Not only are they completely addicting, but because they can double as a sweet treat and feed a crowd.